ریاحی, محمد, احمدی, علیرضا. (1397). کاربرد شبکه های عصبی مصنوعی در شناسایی و طبقه بندی عیوب سازه های ورقی کامپوزیتی با استفاده از امواج فراصوت هدایت شده. علوم و فناوری کامپوزیت, 5(3), 343-352. محمد ریاحی; علیرضا احمدی. "کاربرد شبکه های عصبی مصنوعی در شناسایی و طبقه بندی عیوب سازه های ورقی کامپوزیتی با استفاده از امواج فراصوت هدایت شده". علوم و فناوری کامپوزیت, 5, 3, 1397, 343-352. ریاحی, محمد, احمدی, علیرضا. (1397). 'کاربرد شبکه های عصبی مصنوعی در شناسایی و طبقه بندی عیوب سازه های ورقی کامپوزیتی با استفاده از امواج فراصوت هدایت شده', علوم و فناوری کامپوزیت, 5(3), pp. 343-352. ریاحی, محمد, احمدی, علیرضا. کاربرد شبکه های عصبی مصنوعی در شناسایی و طبقه بندی عیوب سازه های ورقی کامپوزیتی با استفاده از امواج فراصوت هدایت شده. علوم و فناوری کامپوزیت, 1397; 5(3): 343-352. بهره‌گیری از روشهای مبتنی بر هوش مصنوعی برای کاهش نقش تفاسیر انسانی در تحلیل دا‌ده‌ها و اخذ نتایج مناسب، همراستا با افزایش سرعت، کاهش خطا و تعدیل هزینه-ها در فرآیندهای ارزیابی غیرمخرب و پایش سلامت سازه‌ها مورد توجه جدی محققان قرار گرفته است. در این پژوهش، طراحی و اجرای یک سامانه پایش سلامت سازه‌ای مبتنی بر پردازش هوشمند سیگنال امواج فراصوت هدایت شده به منظور شناسایی و دسته‌بندی سه نوع خرابی متداول در سازه‌های کامپوزیتی ورقی انجام پذیرفته است. با ایجاد سه نوع خرابی شامل تورق، شکاف و سوراخ در یک ورق کامپوزیتی چند لایه از جنس پلیمر تقویت شده با الیاف شیشه و تقسیم آن به چهار ناحیه مختلف، نسبت به تعبیه 9 مبدل پیزوالکتریک با نقش دوگانه محرک و سنسور و با آرایش شبکه‌ای اقدام شده و سیگنالهای امواج منتشر شده در هر چهار ناحیه مذکور در قالب 12 مسیر در سه راستای مختلف و 240 سیگنال ذخیره گردید. در مرحله بعد، استخراج ویژگی از سیگنال‌ها با روشهای پیشرفته پردازش سیگنال نظیر تبدیل موجک انجام پذیرفته و داده‌های حاصل، برای آموزش یک شبکه عصبی پرسپترون چند لایه از نوع پیشرونده با روش پس‌انتشار خطا مورد استفاده قرار گرفت. نتایج حاصل نشان می‌دهد، الگوریتم شبکه عصبی طراحی شده و آموزش دیده در این تحقیق، قادر به ایجاد تمایز میان نواحی سالم سازه از نواحی معیوب بوده و علاوه بر آن موفق به دسته‌بندی انواع خرابی‌های موجود در سازه با بازدهی قابل قبول (میانگین حدود 80%) شده که قابلیت تعمیم به شرایط و پیکربندی‌های مختلف و حالت‌های نامعلوم را دارد. Using methods based on artificial intelligence to reduce the role of human interpretations in data analysis and obtaining the favorable results, in line with increasing the speed, reducing the errors and adjustment of the costs in the nondestructive evaluation and structural health monitoring is seriously concerned by researchers. In this study, the design and implementation of a structural health monitoring system is performed by the intelligent signal processing of the ultrasonic waves in order to identify and classify the three common defects in the composite plate-like structures. By creating three types of damages including delamination, crack and hole in the multi-layer composite plate made of glass fiber reinforced polymer and dividing it into 4 different zones, 9 piezoelectric transducers with dual role of actuator and sensor are attached with their network arrangement and the propagated signals in the four mentioned zones on the 12 paths in three different directions including 240 signals were stored. In the next step, extraction of the features from the signals is conducted by the advanced signal processing techniques such as wavelet transform and the findings have been used to train a neural network of advanced multilayer perceptron by back-propagation error method. The results show that the trained neural network algorithm is able to differentiate between the intact zone from the damaged ones. In addition, it has classified the types of current defects and damages in the structure with the acceptable efficiency (the average is about 80%), which can be generalized to the different conditions. Kaw, A. K., “Mechanics of Composite Materials“, CRC press, 2005. Balageas, D. Fritzen, C.-P. and Güemes, A., “Structural Health Monitoring“, John Wiley & Sons, 2010. Speckmann, H. and Roesner, H., “Structural Health Monitoring: A Contribution to the Intelligent Aircraft Structure“ in Proceeding of 17, 2006. 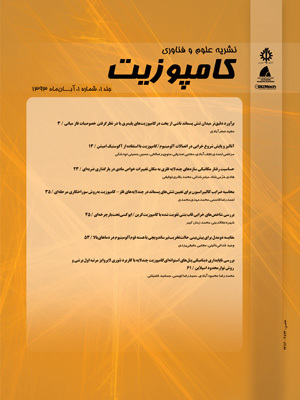 Riahi, M. and Ahmadi, A., “Comparison and Analysis of Two Modern Methods in the Structural Health Monitoring Techniques in Aerospace“ in Proceeding of International Society for Optics and Photonics, pp. 98041Y-98041Y-7, 2016. Su, Z. Ye, L. and Lu, Y., “Guided Lamb Waves for Identification of Damage in Composite Structures: A Review“ Journal of sound and vibration, Vol. 295, No. 3, pp. 753-780, 2006. Staszewski, W. Boller, C. and Tomlinson, G. R., “Health Monitoring of Aerospace Structures: Smart Sensor Technologies and Signal Processing“, John Wiley & Sons, 2004. Mitra, M. and Gopalakrishnan, S., “Guided Wave Based Structural Health Monitoring: A Review“ Smart Materials and Structures, Vol. 25, No. 5, pp. 053001, 2016. Su, Z. and Ye, L., “An Intelligent Signal Processing and Pattern Recognition Technique for Defect Identification Using an Active Sensor Network“ Smart materials and structures, Vol. 13, No. 4, pp. 957, 2004. Standard, A., D3039-D3039m-14, Standard Test Method for Tensile Properties of Polymer Matrix Composite Materials, Doi: 10.1520-D3039-D3039m-14, 1995. Ochôa, P. Infante, V. Silva, J. M. and Groves, R. M., “Detection of Multiple Low-Energy Impact Damage in Composite Plates Using Lamb Wave Techniques“ Composites Part B: Engineering, Vol. 80, pp. 291-298, 2015. Su, Z. Ye, L. and Bu, X., “A Damage Identification Technique for CF/EP Composite Laminates Using Distributed Piezoelectric Transducers“ Composite structures, Vol. 57, No. 1, pp. 465-471, 2002. Rose, J. L., “Ultrasonic Waves in Solid Media“, Cambridge university press, 2004. Yeum, C. M. Sohn, H. Ihn, J. B. and Lim, H. J., “Instantaneous Delamination Detection in a Composite Plate Using a Dual Piezoelectric Transducer Network“ Composite Structures, Vol. 94, No. 12, pp. 3490-3499, 2012. Su, Z. and Ye, L., “Identification of Damage Using Lamb Waves: From Fundamentals to Applications“, Springer Science & Business Media, 2009. Weeks, M., “Digital Signal Processing Using Matlab & Wavelets“, Jones & Bartlett Learning, 2010. Su, Z. and Ye, L., “Digital Damage Fingerprints (DDF) and Its Application in Quantitative Damage Identification“ Composite Structures, Vol. 67, No. 2, pp. 197-204, 2005. Graupe, D., “Principles of Artificial Neural Networks“, World Scientific, 2013. Samarasinghe, S., “Neural Networks for Applied Sciences and Engineering: From Fundamentals to Complex Pattern Recognition“, CRC Press, 2016. Nazarko, P. and Ziemianski, L., “Damage Detection in Aluminum and Composite Elements Using Neural Networks for Lamb Waves Signal Processing“ Engineering Failure Analysis, Vol. 69, pp. 97-107, 2016. Liu, S. Du, C. Mou, J. Martua, L. Zhang, J. and Lewis, F., “Diagnosis of Structural Cracks Using Wavelet Transform and Neural Networks“ NDT & E International, Vol. 54, pp. 9-18, 2013. Misiti, M. Misiti, Y. Oppenheim, G. and Poggi, J.-M., “Wavelet Toolbox“ The MathWorks Inc., Natick, MA, Vol. 15, pp. 21, 2014. Ramadas, C. Balasubramaniam, K. Joshi, M. and Krishnamurthy, C., “Detection of Transverse Cracks in a Composite Beam Using Combined Features of Lamb Wave and Vibration Techniques in Ann Environment“, 2008. Su, Z., Wang, X. Chen, Z. and Ye, L., “A Hierarchical Data Fusion Scheme for Identifying Multi-Damage in Composite Structures with a Built-in Sensor Network“ Smart Materials and Structures, Vol. 16, No. 6, pp. 2067, 2007. De Fenza, A. Sorrentino, A. and Vitiello, P., “Application of Artificial Neural Networks and Probability Ellipse Methods for Damage Detection Using Lamb Waves“ Composite Structures, Vol. 133, pp. 390-403, 2015.